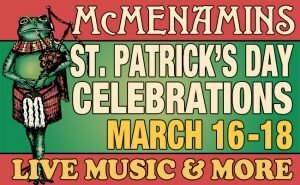 2018 St. Patrick’s Day Across the Land w/ McMenamins | Live Music, Irish Dancers, McMenamins Irish Stout, Irish Food Specials, Bagpipes & more! We’re marking our favorite holiday with seasonal McMenamins Irish Stout, Irish Coffee, Irish Reuben & MacSleyne Irish Stew. Bring your Passport to get the green just-for-fun stamp, just for stopping by! For the first time, we’ll have cans of our Foggy Dew Irish Lager to go, $3 each. At select locations, we’ll sell a limited supply of our distilleries’ two versions of 2018 Devils Bit Whiskey, barrel-aged and released on St. Pat’s and only available until it sells out–which is often the same day! Each 200ml bottle will be $23, and the limit is two per person. and don’t forget your Just-for-Fun Passport stamp! Kathryn Claire – 3 p.m. ’til 5 p.m. The Van Rontens – 5:30 p.m. ’til 7:30 p.m.
Castletown – 8 p.m. ’til 10 p.m.
Spud & the Snake Skinners – 7 p.m. ’til 9 p.m..
Molly Malone Irish Dancers – 1 p.m.
Cul an Ti – 1:30 p.m. ’til 3 p.m.
Na Rósaí – 3:30 p.m. ’til 5 p.m.
Cedar Teeth – 8 p.m. ’til 10 p.m.
Sky in the Road – 3 p.m. ’til 5 p.m.
Outbound Traveler – 5:30 p.m. ’til 7 p.m.
New Shilling Band – 3:30 p.m. ’til 6 p.m.
Anchor & Reel – 7 p.m. ’til 9 p.m.
Roaming: River City Pipe Band – 4 p.m.
Roaming: Hills and Hollows – 1 p.m. ’til 4 p.m.
Irish Dancers – 11 a.m. ’til 11:30 a.m. The Stomptowners – 11:30 a.m. ’til 2 p.m. The June Bugs – 2:30 p.m. – 5p.m. Billy D – 7 p.m. ’til 9 p.m. The Murray Irish Dancers – 3 p.m. ’til 5 p.m.
Cul an Ti – 5:30 p.m. ’til 7:30 p.m.
Irish Dancers – 6:30 p.m.
Dance Hall Days – 8 p.m. ’til 10 p.m.
River City Pipe Band – 7 p.m. The Murray Irish Dancers – 11:30 a.m. ’til 1 p.m. The Stomptowners – 1:30 p.m. ’til 4 p.m.
Kathryn Claire – 4:30 p.m. ’til 7 p.m.
Castletown – 7:30 p.m. ’til 10 p.m. The Murray Irish Dancers – Noon ’til 1:30 p.m.
Anchor & Reel – 2 p.m. ’til 3:30 p.m.
Hawthorne Roots – 4 p.m. ’til 5:30 p.m.
Biddy on the Bench – 6 p.m. ’til 8 p.m.
Anchor & Reel – 5:30 p.m. ’til 7 p.m.
Hawthorne Roots – 7:30 p.m. ’til 10 p.m.
Blarney Thursday – 2 p.m. ’til 4 p.m.
Thon Dudley and Eddie Parente – 5 p.m. ’til 7 p.m.
Ma Fondue – 7:30 p.m. ’til 10 p.m.
Brothers Dunne – 6 p.m. ’til 9 p.m.
Spud and the Snake Skinners – 4:30 p.m. ’til 6:30 p.m.
Castletown – 7 p.m. ’til 9 p.m.
2 Responses to 2018 St. Patrick’s Day Across the Land w/ McMenamins | Live Music, Irish Dancers, McMenamins Irish Stout, Irish Food Specials, Bagpipes & more! Irish Reverbs at White Eagle!